Discover the cream pie that made Boston famous! 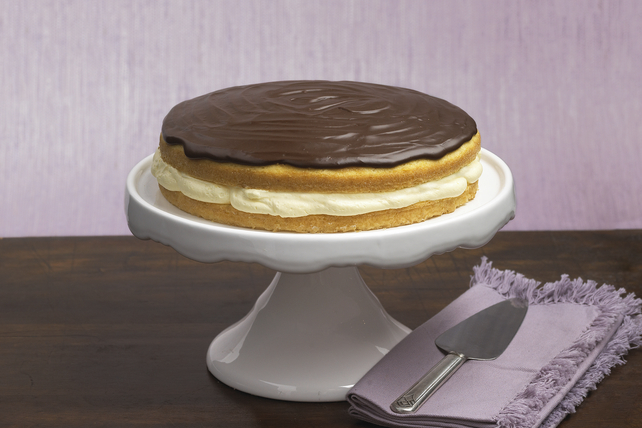 Boston Cream Pie includes pudding, cake and a layer of chocolate. Try our Boston Cream Pie tonight! Beat pudding mix and 1 cup milk in medium bowl with whisk 2 min. Stir in COOL WHIP. Let stand 5 min. Meanwhile, cut cake horizontally into 2 layers with serrated knife. Microwave chocolate and butter in medium microwaveable bowl on HIGH 1 min. or until butter is melted; stir until chocolate is completely melted and mixture is well blended. Add sugar and remaining milk; mix well. Spread over cake. Refrigerate 1 hour. Use a 2-layer cake mix to bake 2 (8- or 9-inch) round cake layers. Cool completely. Use 1 of the cake layers as directed. Wrap remaining cake layer tightly in plastic wrap, then in foil. Store in freezer up to 1 month. Place cooled cake layer on serving plate. Make 2-inch-deep horizontal cut around side of cake using long serrated knife. Then, cut all the way through cake layer to make 2 layers.